So, Saturday night, being ever so frugal, we watched the free movie I received from BMW. 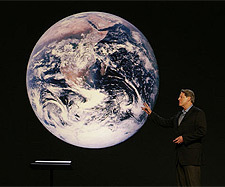 Politics aside, Al Gore’s environment movie isn’t that bad. Not nearly as preachy as I’d expected. In fact, it wouldn’t be that much of a stretch to call it entertaining. One thing that stuck a chord with me was when he mentioned that the “Surgeon General” warning appearing on cigarettes didn’t put any sort of dent in the numbers of smokers. In my life, I’ve noticed the number of smokers under the age of 35 is relatively small. I won’t say its due to the warnings on the package suddenly having been acknowledged. The new laws over the past few years restricting where you can smoke has a little to do with it, I suppose, but I think it’s due more in part to the taxes put on cigarettes. They’re expensive. Really expensive. That brings me to his environmentalist point. He thinks that if everyone does a little to help, the global warming problem will solve itself. I agree. His biggest point was that it takes more than public awareness (or a little warning sticker like on the cigarettes) to get the ball rolling. The government has to get involved with laws or taxes or whatever. Anyway, one of those little things are the CFB light bulbs, which honestly, I think have caught on, just based on public awareness. In our house, I’d say 75% of our light bulbs are the new CFB kind. Probably 15% are still normal bulbs because the fixtures won’t accomodate the new style. It has definitely saved us (noticeable) money each month on our electric bill — but this is where the government steps in. In our home state, the power company — now pulling in less money from it’s customers due in part to the popularity of the CFB — has gone to the state DPUC and requested a rate increase. And you know what? The state will accept it. So, while we saved some money by cutting out electricity use, the government is going to give a thumbs up to the power company, so that they can charge more. I guess we’re back where we started. Let me start by saying that I’ve never been on the Apple side of the fence. And I’ve never considered hopping that fence either. I was going to hold off on this post until Friday, to time it with the iPhone’s launch, but I didn’t really want to add to the ridiculous hype already slated for the release… so here’s my take on it a few days early. As you may have guessed already, I’m not going to buy a $600 iPhone (ever), but I am interested in how the market will respond to the device. Apple’s marketing machine is second to none, with a great track record to prove it, so I’m sure they will sell millions of these overpriced gadgets, but this is the first time they’ve drifted into an already saturated market. How will it do, facing huge, not to mention established, competition from Treo, RIM, HP, Motorola, Samsung, LG, Sony Ericsson, and Nokia? Not one of those companies will be pushed aside easily. And, nearly all of those companies already offer a device that can and will do what the iPhone does, except they do it much better, have been for months, for half the price, and that can fit in the palm of your hand. What is Apple bringing to the table that isn’t already commonplace? What is the hype? 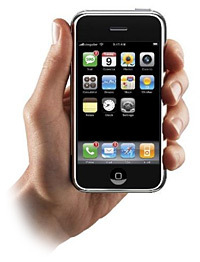 With the iPod, Apple exploited the fact that the MP3 player market had no clear leader. Sadly, for the general public, there are MP3 players available at Walmart for under $30 that exceed what the iPod does… weird how an overpriced memory card with a jack for headphones became a cultural icon — but that’s Apple’s marketing at work. In all honesty, the whole touch screen with gestures deal seems like more of a gimmick than anything super useful. And not to be gross, but unless the touchscreen is fingerprint-proof, you’ll also be carrying around a microfiber cloth to watch your movies in oil-free goodness. Just think how much oil from your skin will transfer when using it as a touch interface or from your ears during a call. Just being realistic. Oddly enough, being a bit of a geek, I also find it peculiar that a phone manufactured by a computer company would create a cellphone that will not serve as a wireless modem for a laptop, err, iBook. Is Apple abandoning their computing roots in favor of re-inventing Sony WalkMans and Nintendo GameBoys? Apparently. And look at the size of the thing?! It’s almost as big as my corded phone at home. It’s like people are getting excited again about those brick phones from the 1980’s. Start lugging that thing around, you know, to impress people. Anyone still carrying a boombox on their shoulder? You will be soon, it seems; if the Apple trend continues. Technology is totally going backwards. A couple of years ago, people wanted a 60 inch plasma TV with a surround-sound system but now the goal is to watch a movie on your phone with tinny sound through cheap headphones… I don’t get it. Am I strange in that all I really want my cellphone to do is make telephone calls? Sadly, the reception on every cell phone I’ve ever owned leaves something to be desired. Maybe if the previously mentioned phone companies concentrated less on the gimmicks like ringtones and camera features, the phones would actually work like, well, the old corded phones. Now that’s a feature I’d like featured on my phone! Beginning July 1, the State petroleum tax is set to rise 6.72 percent to 7.53 percent, adding an extra 2 cents per gallon. Seriously, I’d venture that it would be an accurate statement to say that your typical American struggles with the whole concept behind fractions. Hey, fourth grade math was tough, right? Further, percentages are like fractions. In fact, they *are* fractions. Let’s not kid around. Now, one step even further, in this article, they reference a percentage of a percentage?! Do you think many of the readers (actually, do the general masses even read the paper or watch the news?) can get a good grip on that? I highly doubt it. Maybe that’s why they dumb it down for the simpletons, aka the general masses, by tacking on the “2 cents per gallon” bit at the end. But it’s not that simple. Saying $0.02 per gallon sounds like a flat tax — but it’s not. Like I said last month when I commented on the price of gas, the tax is dependent on the price. It’s a percentage of the price. As the price rises, so too does the tax. By August, this 6.72 percent tax increase will likely be nearing $0.04 per gallon. Funny, too, how they never mention in the article how much, per gallon, you’re already paying for this State petroleum tax. It is listed as a percentage, of course, on nifty stickers on every pump, but they don’t stick them front and center — you know, like a surgeon general warning on a pack of smokes. Taking into account the federal taxes also built into the price of gas, if the public really understood where most of their payment is actually going and that gasoline really isn’t that expensive after all, well, it just might be time to break out the battering rams and catapults for a good old fashioned public uprising. Shame that will never happen because so few care to read the sticker. And politicians don’t want to disrupt their easy, and somewhat hidden, income stream. Earlier this week, Hillary Clinton selected “You and I” by Celine Dion as her official campaign song. The ridiculousness of having an official campaign song aside, as a Canadian, it’s always kind of bothered me how un-American the most über-American things have become. See, Celine Dion is a Canadian. A francophone, even. After 9-11, when all of the celebrities got together for that television special that ran on pretty much every channel, I thought it was sad that they closed the show with Celine Dion belting out the “Star Spangled Banner” with her thick French accent. Yes, it was a good rendition, I’ll admit, and she’s got a great voice, but I think it would have been wiser, not to mention more appropriate, at the time to have an American singer belt it out with true meaning and feeling. Kinda like Whitney Houston before she became a crack addict. Celine can belt out “O Canada” with true feeling for sure, but she can only sing the US anthem. Other songs in the running for Hillary’s official campaign song were: KT Tunstall’s “Suddenly I See; U2’s overused “Beautiful Day”, a Monkee’s remake of “I’m a Believer” by Smash Mouth; and Shania Twain’s “Rock This Country!”. Okay, let’s see… KT Tunstall is from Scotland. She sounds like it too. The members of U2 hail from Ireland. They don’t even sound like Americans. Like Celine, Shania Twain is also Canadian. Smashmouth is from California, and “I’m a Believer” was written by native New Yorker Neil Diamond (he recorded it first too), but it was the Monkees that made it a hit song. And it was England’s Davy Jones that made the Monkees popular. Yes, I know Micky Dolenz sang lead on that specific song, and he’s from California, but the whole band was openly a Beatles rip-off. And the Beatles were British. So, by a technicality, it still re-enforces my point. It’s too bad for American politics that artists like Bruce Springsteen and John Cougar Mellencamp often take political sides and are very vocal about it. Or that someone like Billy Joel is such a notorious drunk that using something from his catalog might not be such a great idea. I suppose the candidates could select a number of country tunes, but I can’t honestly name a single country song that doesn’t leave a bad taste in my mouth. That’s one of the reasons I’ll never drive a Chevy. Anyway, it got me thinking… The members of Destiny’s Child are all homegrown Americans. Where was “Bootylicious”? Hillary could have used that. I’m not certain the country is ready for that jelly. Ice-T is American too. Rap is an American genre. What about “Cop Killer”? Either may have made an interesting “outside the box” choice. The computing side of the company was never great to begin with, but ever since their “rebirth” with the iMac (ooooooh, pretty colors! ), they’ve been that annoying mosquito buzzing around your ear. You just can’t get them to go away…. The most recent campaign, though a few years old now, is still pretty entertaining, even viewing them from the “PC” side of the aisle. Effective with the masses too, I’m sure. I could refute every claim and inference made in each individual commercial to date, but I’ll spare you. To the veteran computer user, it’s all obvious propaganda. 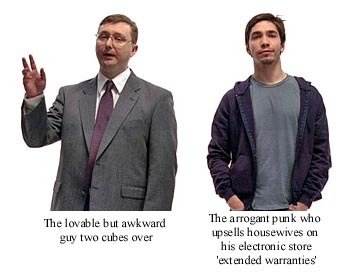 The funniest part of the campaign to me are all of the references to how square the “PC” fellow is, compared to the hip “Mac” guy. Now I don’t know about you, but about 10 minutes after graduating from high school, I stopped caring about being hip or cool. Now it was time to be successful. 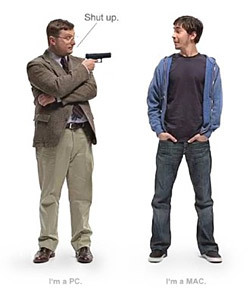 No offense to the “Mac” character, I’m sure he’s a nice guy, but I don’t really want to be like the guy who always wears a hoodie over a ratty t-shirt and never combs his hair. Or the one who brags about how cool his “video-mails” are. I don’t know about your neck of the woods, but around here the guys with video cameras hooked up to their computers are generally perverts. Not exactly something I want to emulate. Sure, Macs don’t crash — but that’s because they’re toys. You can’t push a Mac to the brink because there isn’t any software available to ‘push’ them. They openly admit that they don’t do “spreadsheets” or “calculations” in the commercials in favor of making silly graphics or whatever. Okay, um, what did we buy this computer for again? Oh yeah, watching DVDs… Wait a minute, isn’t that what the TV is for? The virus topic is another slightly skewed shot at the PC fellow. Fact is, even in 2007, far less than 10% of computer users on the internet are using Macs. A *tiny* minority. The “purpose”, while disturbing, of a virus to to infect as many as possible, so why on earth would some loser computer-whiz kid write some malicious code to infect a tiny group of computers? Hey look, my personal virus wasn’t even a blip on the map. It’s about bragging rights, and a virus for a Mac can’t offer that. Hey, at least it’s possible. Don’t see too many ‘Grape’ iMacs in service these days… (You can find them in the “bulky-trash” dumpsters at your local dump though). True, upgrading a Mac is easy as can be — just buy a whole new Mac! Being a PC user, I’m still using my trusty HP keyboard from 1995 and a Dell monitor from 1997. My hard drive from my first 386 still works today in my current set-up. Can Mac say that? I think not. When I do upgrade my CPU every couple of years, and that’s all I need to upgrade, it’s never more that $400. My graphics cards, sound cards, monitors, etc… just make the trip with me. And the old CPU’s just end up as servers — I still have a Pentium-60 in service. That’s nearly 13 years old. And just where are the Mac servers? Where are the Macs in business? Let PC and his cousin who runs Unix take care of the big stuff. Seriously, don’t even consider a Mac. Computers aren’t that confusing or difficult anymore; owning a mac just labels you as retarded. And yes, there is something wrong with that. I like to drive. A lot. In my travels, I’ve hit the lower 48, along with 9 provinces. I like to think I have a pretty good idea of the driving habits on those in North America. Okay, that may by over stating it just a bit, but I do know that some states have left more of an impression than others. The most aggressive drivers, (other than anyone in a pimped out Mitsubishi), hail from the state of Rhode Island and the province of Quebec. These folks will ride your bumper like no one else. A merge or, heaven forbid, a yield sign mean nothing to these drivers. The quirkiest part is that although they are generally very agressive, they don’t go into a rage status. I have yet to witness any hand gestures or facial expressions. The just refuse to give you space with a blank look on their face. The worst drivers though, by far, are those from Virginia. 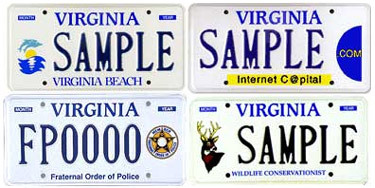 I honestly think that state has so many variations of their license plate design (seriously, over 180 of them!?) so as to fool other drivers into thinking, “Oh, that idiot’s not from Virginia.” Fact is, most of the time, they are. What makes them the worst? Well, for starters, let’s pretend we’re taking the drive from New York City down to Miami. Major highway, three lanes — slow, travel, and passing — for nearly the entire stretch. Generally, you can maintain a speed of around 70mph for the entire trek once you’re clear of the New Jersey tolls. In theory, you should be able to hang in the travel lane. But this is where the Virginia driver comes into play. See, apparently in Virginia, and Virginia only, there is no such thing as a slow, travel, and passing lane. You’re just expected to pick the lane on your choice and the speed, or lack there of, of your choice. So, it’s about 3:00am and there are just a few trucks on the road, and the diehard drivers like myself making our way through North Carolina. Thinking we’ve *finally* cleared all of the NJ stoppages, DC traffic, and Virginia is in our rear view, not to mention that it’s the middle of the night, it should be smooth sailing all the way to sunny Florida. I’m passing a car on the right… and they’re going… 55mph?! Up ahead, I see truckers moving into the travel lane. Virginia plate in the slow lane — but now the trucker is moving into the passing lane — ooooh! He’s even flashing his lights at the slow poke in front of him. Okay, my turn. I go all ‘Rhode Island’ on this one. I could have easily moved into the passing lane and pass this guy, but that’s not the point. It’s pre-dawn, there’s a fair amount of traffic on the road considering the time, and this guy is going 15 miles under the speed limit?! The slow lane is empty. Still doesn’t seem to get it. One of those double trailer trucks eventually flies by on his right hand side. Dude, you just got passed with authority by one of the slowest trucks on the road. The crazy part is that when you do pass them, they look over at you like, “I wonder why his headlights were flashing? I’d bet that truck blew his horn to let him know his headlights weren’t properly aimed…” Unreal. On top of the fact that they don’t have *any* highway etiquette (only state in the union — seriously! ), they’ve also ‘caught’ the “what’s a signal for” but that’s plagueing the entire continent. You know what really fires me up? Yep, that’s right. And I’m not just talking about the short buses for the “special” students. A few years ago I bought a house in the same town that I work in. We’re talking maybe a 2 mile commute. 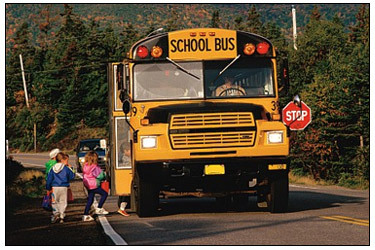 Now, every morning on my way to work, as luck would have it, I get behind a bus that stops at a student’s house and the bus puts on his red lights and the stop sign comes out (and whats up with the new lance contraption on the front bumper these days? Do buses joust after hours? ), and waits for him to come out of the house. When he does eventually come out, he takes his sweet time, and he’s usually still getting dressed — and often stops to go back into the house to grab his back pack (or kiss his Mom as I like to think). But anyway, the kid, let’s call him Harold, eventually gets on the bus — and the bus sits there until he sits down. Apparently he thinks he’s one of the cool kids cause I can only assume it takes so long for him to sit down because he’s making his way to the back. In my day, once the doors closed behind you, you might have had 10 seconds before the bus started moving again. Can you imagine if trains ran the way school buses do now? They’d never move. So, while you might think that things are moving now; no, two houses later, yes, two. We’re talking 120 feet — maybe 4 bus lengths (not including the lance) and the lights go back on, the sign comes out, and we repeat the whole process. The saddest part is that these are HIGH SCHOOL STUDENTS?! And because of that, being the car immediately behind the bus, I’m subjected to numerous finger gestures from the aforementioned “cool” kids. Or is it “kewl” these days. Whatever. Harry is a loser as far as I’m concerned. Now, I’m not an impatient person, but when I was in school (and that’s not that long ago), I rode the “loser cruiser” every single day. I’m not going to say I had to walk a mile, uphill, each day through the snow, I won’t go that route, it was usually maybe 200-300 meters from my front door where a bunch of us from the neighborhood would stand and wait — maybe 5 minutes, sometimes in the rain even, but that’s not the point. And if you weren’t there, the bus DID NOT wait. Some of my fondest memories are of my next door neighbor chasing the bus and on the rare occasion that the bus did stop again, the walk of shame they were forced to make as they found a seat. Fat chance of that happening these days. The school bus is now more like a personal chauffer service. Sort of explains the “entitlement” attitude of the current generation. And the fact that they don’t need to walk farther than their front door anymore might help explain all the fat kids out there. You might wonder what I’d say if these weren’t high school kids or if my feelings would change… Well, I’ll tell you. See, I come home for lunch each day too, which means I catch the kindergarten bus. Now don’t get me wrong, they’re really cute with their “Dora the Explorer” lunch boxes and stuff and it’s neat cause they actually wait out by the road — definitely a step up from the lazy teenagers. These kids are excited to get on the bus and go to school, which is great. Now, I can understand why a mother might not want her 5 year old to be crossing the street and such. That’s easy to comprehend. At the same time, just 15 years ago, 5 year olds *were* crossing the street. Were our mothers bad mothers; putting us in harms’ way? They taught us to look both ways, then go. Atleast that’s what I was taught. It seems they don’t teach that any more and I think that’s where the problem began. Kids don’t know that cars hurt. And that’s because they’ve never had to cross the street, so their parents haven’t had the need to teach them that, well, cars hurt. They really hurt. They can even, gasp, KILL YOU! So I guess that’s just one of the things that snarks my fries these days. I look back fondly on my time spent at the bus stop each morning with Bryan, Megan, Alicia, David, Tammy, Seth, Steve, and Nick. Okay, maybe not Tammy, I never really liked her. And yeah, sure, when we got to school and filed off of the bus, we all went our seperate ways and were assimilated into our individual cliques, but for those 5 minutes standing on the corner, we were kinda like a big family at the dinner table. And yes, we kissed our mothers as we left the house, on time, to catch the bus. Did I mention we were all thin, happy, and sociable too? You know, the way kids *should* be. 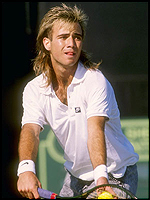 Like Andre Agassi once pitched for Canon Rebel cameras, image truly is everything. Image is an asset. Your best asset. And one you can totally control. People do not love you for who you are. Bosses do not give promotions based on your work performance. Banks do not give you money based on your ability to repay. Doctors are not licensed based on their competency. People love you for who they think you are. Bosses give promotions based on their perceived value of you. Banks give you money based on your perceived ability to repay. Doctors are licensed based on their perceived competency. No matter how bright, talented, and skilled you will go nowhere if no one recognizes it. No matter how deficient you are, the world is yours to take if no one notices your failings. Learn to master your image and you have found the levers that motivate people to help you. It blows my mind how many folks out there don’t understand this. Poke around for some familiar faces on myspace.com or facebook, or for that matter, any ‘local’ band website — you’ll quickly lose respect for some of your friends and acquaintances. In my opinion, it’s messed up on it’s own to let someone take pictures of you when you’re not at your best, you know, sloppy drunk or whatever, but to post those pictures — I mean, actually sitting down and saying, “yeah, that one is a good representation of me” and then hitting submit is just shocking. It’s like slandering yourself. “Don’t I look ‘kewl’ here where I’ve got my face pressed against a drag queen’s tight abs?” I mean really? One fellow I know has a shot of him holding up some random bimbo doing a keg stand, while just above it in their profile it states that they’re 32 years old. Um, hello? Are people that stupid? Apparently. Oh, and don’t hold your breath for any less than flattering shots of yours truly… I’ve always been aware of my image.